Growing up in Watertown, New York, Bob Rogers never imagined his life’s biggest inspiration would come from a ball, a hoop and a coach in a town more than 2,100 miles away. Rogers and a Canton, New York, junior college teammate Ken Goodwin, were a force on the court in the late 1950s, and led the team to 34-6 record. Goodwin convinced Rogers to tag along on a trip to visit New Mexico State University and its growing basketball program. That’s when Rogers met basketball head coach Presley Askew – one of NMSU’s greatest coaches and a mentor Rogers will never forget. 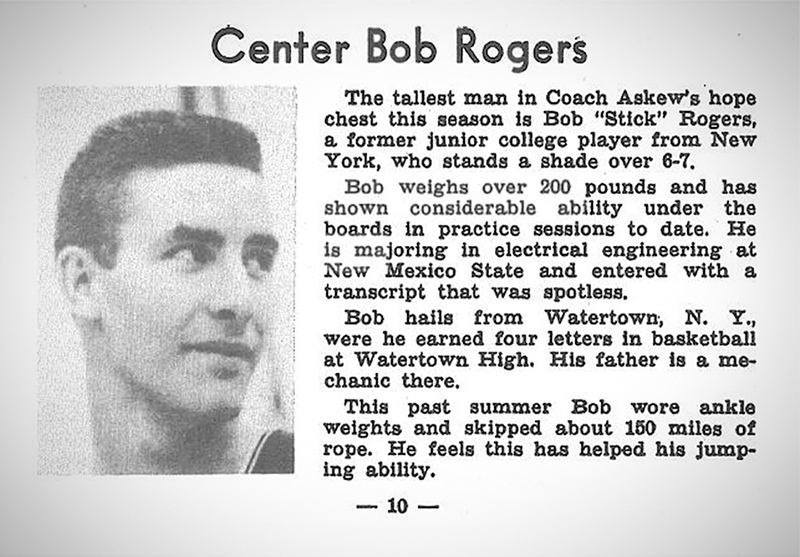 Nicknamed “Stick,” Rogers received a scholarship and played center for the team. The Aggies enjoyed great community support after two previous back-to-back NCAA Tournament appearances, but the team dropped to 10-14 in 1961-62 and 4-17 in 1962-63. By 2011, he and his wife, Margaret, decided to bring this inspiration full-circle and honor the man who instilled the “taskmaster mindset” into Rogers. The duo created the Presley Askew Endowed Scholarship, using the IRA charitable rollover, totaling more than $350,000 to date. The scholarship honors student-athletes in men’s and women’s basketball and football who demonstrate academic excellence. One of many to receive the scholarship was women’s basketball player Sasha Weber ’16, who now plays professionally in England. Bob Rogers' experience as a basketball player for Coach Presley Askew transformed Rogers' take on the game and life off the court. 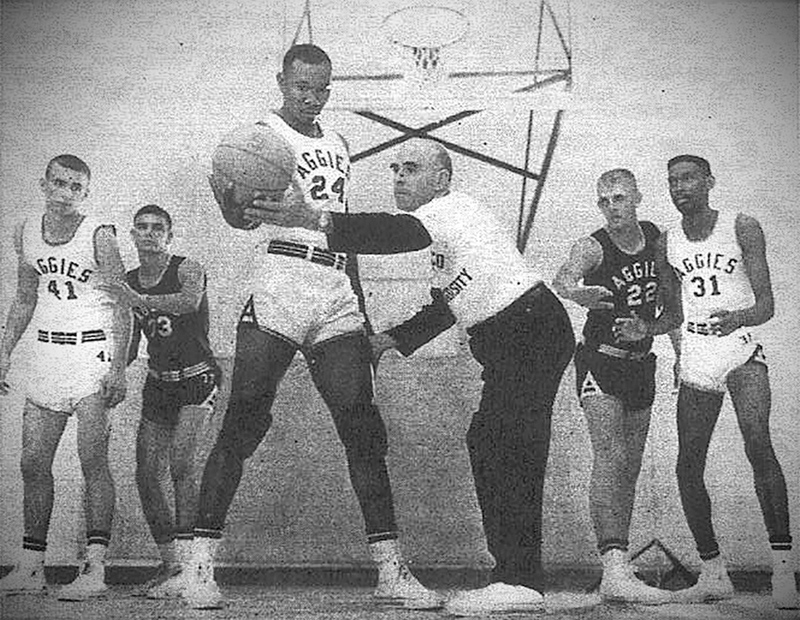 Featuring an early 1960s Aggie men's basketball team, Askew gets hands-on in practice with players. 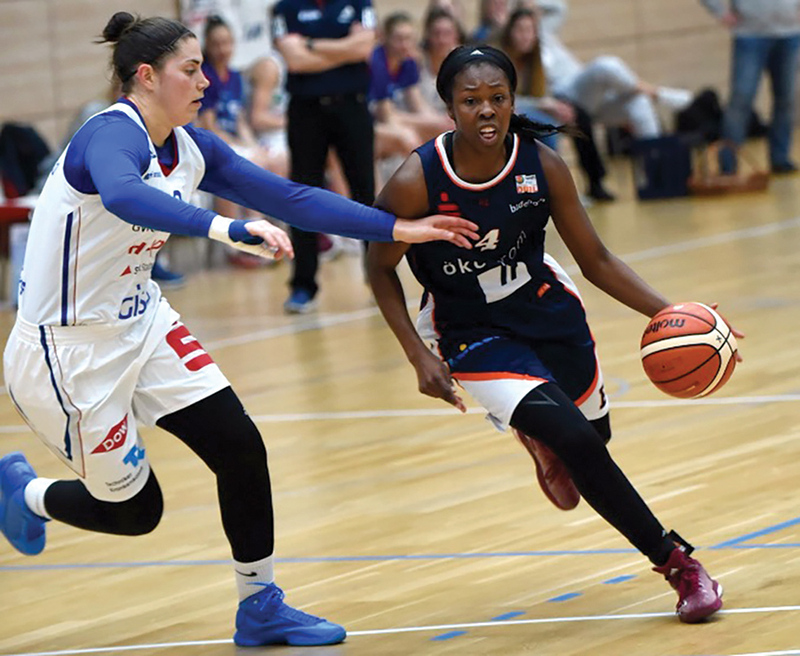 Sasha Weber [right], '16 Aggie women's basketball player and recipient of the Presley Askew Scholarship, now plays professionally in England. Last season, she played for Eisvögel USC Freiburg in Damen-Basketball-Bundesliga in Germany.